Pence’s Doctor Complained About Ronny Jackson to Top White House Aides: ReportChief of Staff John Kelly had memos claiming Jackson may have violated Second Lady Karen Pence’s privacy last fall. Nominating Ronny Jackson to Lead VA Cost Trump His PhysicianIt’s unclear if he’ll leave the White House, but he won’t be attending to the president any longer. Trump’s Unqualified, Scandal-Ridden VA Pick Forfeits NominationRonny Jackson had no relevant experience to manage a bureaucracy. Then, he was accused of alcoholism, pill-pushing, and abusing his subordinates. After Botching Ronny Jackson’s VA Nomination, Trump Doubles DownEven Republicans are blaming Trump’s sloppy selection process for the latest scandal, and his contradictory response only added to the chaos. Trump Implies That Ronny Jackson Should Withdraw VA NominationThe ol’ presidential vote of no confidence. Trump Didn’t Vet VA Pick, and Now Misconduct Claims May Derail His ConfirmationRonny Jackson’s confirmation hearing has been postponed amid allegations said to include excessive drinking on the job and improperly dispensing meds. 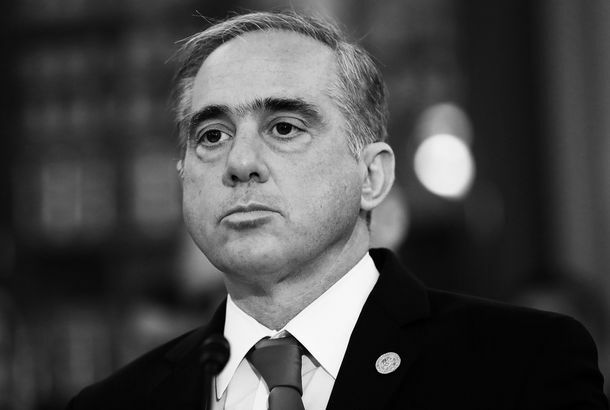 After Backlash, VA Won’t Scrap Program to House Homeless VeteransThe Trump administration’s attempt to realign the program was not well received. Will Trump Insult Veterans by Sending Sarah Palin to the VA?She’s not really qualified, and will create a sideshow wherever she goes. But that doesn’t mean it won’t happen. Lawmakers Finally Hammer Out a Plan to Fix the VA SystemBernie Sanders and Jeff Miller will announce the plan at noon. Obama Picks Former Procter & Gamble CEO to Lead Veterans AffairsBob McDonald is a West Point graduate. Shinseki Resigns in VA Scandal; Obama Accepts ‘With Considerable Regret’“We don’t have time for distractions,” the president said.